Christmas is just around the corner and like every year, the festive spirit is already in the air. Shops are full of gifts, treats and decorations and children have their stockings and lists ready for Santa or the Three Kings. 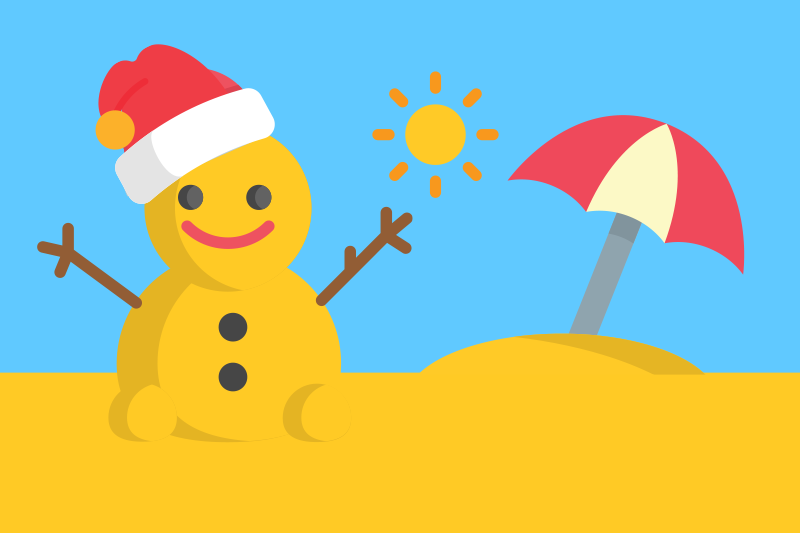 While most parts of the world hope for a white Christmas, there are some countries that celebrate Christmas in the summer. Think barbeques, board shorts and Christmas day tanning and surfing on the beach. Christmas falls in the middle of an Australian summer so celebrations are outdoors thanks to the warm, sunny weather and people put on their summer shorts, dresses and hats to enjoy a day out. Christmas menus include traditional treats as well as barbeques as many people host outside in their gardens with loved ones. You will even find a Santa on some beaches who gives out treats to children. Australian homes may not necessarily have a Christmas tree but you will find flower decorations thanks to a wonderful bloom at this time of the year. Many outdoor events are also organized for people to get together and celebrate. On Christmas Eve, many Australian families watch "Carols by Candlelight" on TV, broadcast from the Sydney Myer Music Bowl in Melbourne. Being summer in Australia, attendees sit outside on the grass with their candles, and watch a huge array of Australian musicians play seasonal music. Garden or beach cricket is also huge, either while Christmas lunch/dinner is cooking, or to work it off afterwards. Fielding with a “stubbie” beer in one hand is also traditional! Since New Zealand is Australia’s neighboring country, Christmas here also falls in the summer season. Children have school holidays and it is a public holiday for working adults. Many prefer going to the beach and camping to see in the festival while others have a celebration at home. Carol services take place everywhere in New Zealand and in bigger towns and cities there are parades where you can spot Santa as well. New Zealand has its own special carols and people sing these at many places. Before lunch, families gather to exchange presents and when it’s time to eat, a barbeque is another fun ritual of Christmas in New Zealand which includes meat as well as fresh seasonal vegetables. Big helpings of desserts bring a festive end to the Christmas celebrations in NZ. South Africa is also in the southern hemisphere and enjoys a summery Christmas period too. Carol singing is a big part of the celebrations and so is the Christmas feast. Fir trees are used for decoration outside houses and children leave stockings to get gifts from Santa. Being summer, flowers are in bloom and people love to be outside as long as it isn’t too hot (imagine!). Pulling crackers, eating roast turkey or beef with yellow rice and raisins and then enjoying a serving of Christmas pudding are all part of the festive tradition. Like the Aussies and Kiwis, many families also opt for a barbeque and make the most of being outdoors. Warm weather welcomes Christmas in Argentina too. Trees are decorated as Christmas trees and people often put cotton balls to depict snowfall as it definitely doesn’t snow at this time of the year! Argentina has a large Catholic population and therefore most people go to attend midnight mass. Pulling crackers is also common here and people eat a hearty dinner consisting of turkey or roast beef. Some also follow a tradition of staying awake on Christmas eve talking to friends and family and then sleeping for most part of the next day. Nativity scene decoration is also big in Argentina and people start the celebrations early as many also celebrate Advent in December. So if you fancy trading in your Christmas jumper and mulled wine for a festive bikini and cranberry margarita there are definitely options. You just need to get yourself to the Southern Hemisphere … and don’t forget your sunscreen!